Steps: Located on the left side of the screen, this panel is used to manage steps for your Image Zoom interaction. Preview: Located at the top of the middle section, this panel is used to arrange steps (zoom regions) on the image. 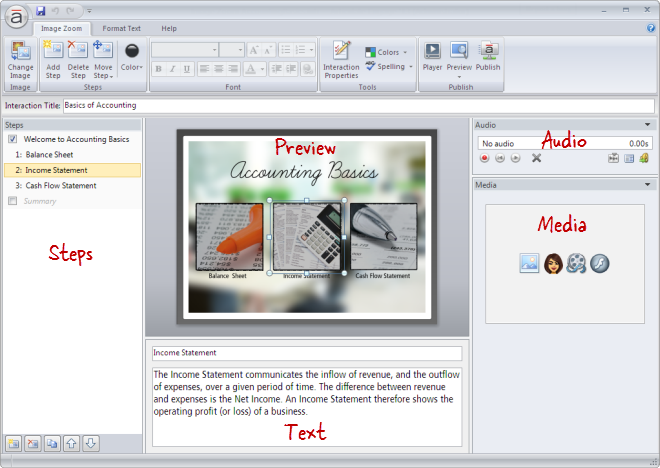 Text: Located at the bottom of the middle section, this panel is used to add text to each step. Go to the Image Zoom tab on the ribbon, and click Change Image. 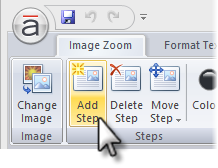 Go to the Image Zoom tab on the ribbon, and click Add Step. 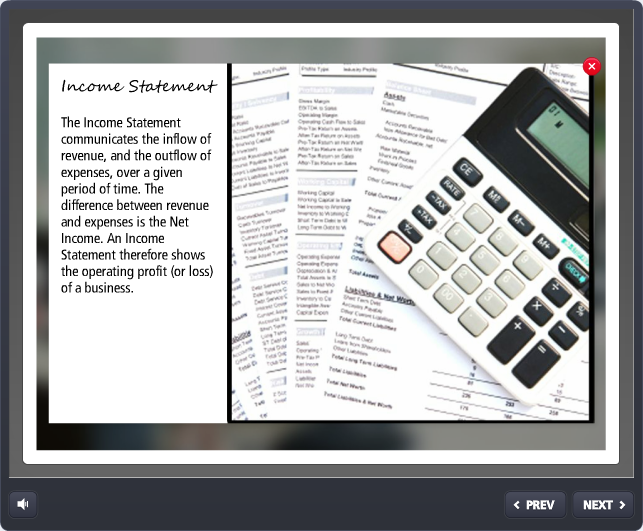 Tip: An Image Zoom interaction can have up to 100 steps (not counting the introduction and summary). Everything within a zoom region will be magnified when learners click it to zoom in. 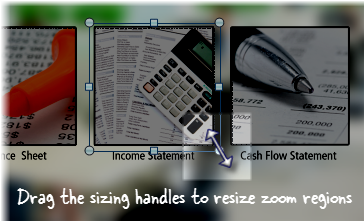 To resize a zoom region, select it in the preview panel to reveal its sizing handles. Then drag any of the sizing handles. Tip: To maintain the zoom region's aspect ratio while you're resizing it, hold down your Shift key and drag one of the corner sizing handles. There are two aspects to arranging steps (zoom regions): layering and spatial layout. Layering refers to how zoom regions behave when they overlap on the image (three-dimensional arrangement). Spatial layout refers to how zoom regions are distributed across the image (two-dimensional arrangement). Layering is controlled by the order of steps in the Steps panel. The first step in the list is the bottommost zoom region on the image. The last step in the list is the topmost zoom region on the board. 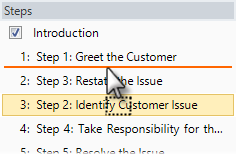 When learners click an area where two zoom regions overlap, the topmost zoom region is the one that will open (i.e., the step farthest down the list in the Steps panel). Drag them to a new location. An orange line will move with your mouse to indicate where the steps will be when your mouse is released. 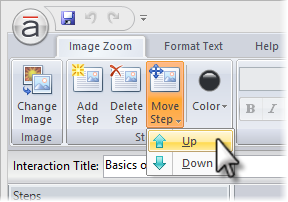 Go to the Image Zoom tab on the ribbon, click Move Step, and select either Up or Down. The order of steps in the Steps panel also determines their sequential order when learners use the previous and next buttons on the player to navigate through your interaction. Spatial layout is easy to control. 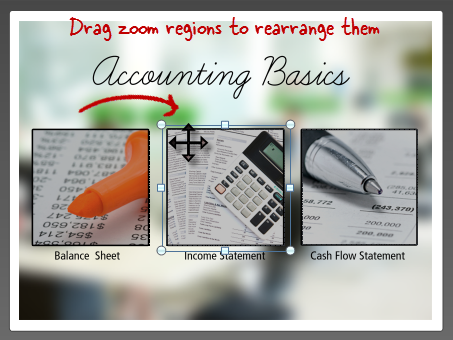 Simply drag zoom regions to a new location on the image in the preview panel. 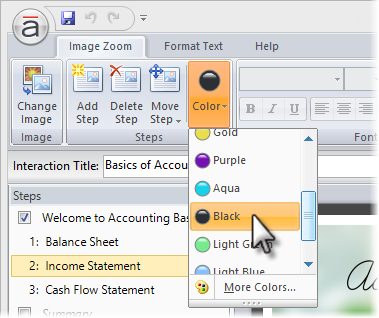 Select a step (zoom region). 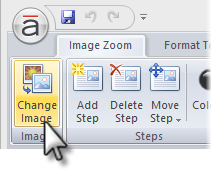 Go to the Image Zoom tab on the ribbon, and click Color (in the Steps group). 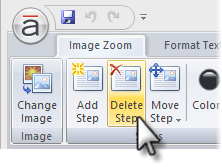 Go to the Image Zoom tab on the ribbon, and click Delete Step.